A cash-strapped government will depend significantly on dividends paid by central public sector units to meet its fiscal deficit target. Going by the latest trend, the 33 units that have declared their dividend have contributed R22,898 crore to the government kitty in 2010-11, which is 31.1% more than the payout of 2009-10. 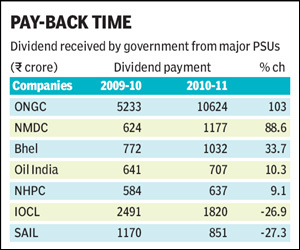 Of these, ONGC, NTPC and IOC account for more than half of the total dividend declared by these PSUs. Just next to them, Bhel has also shown a significant increase in dividend with a pay out of R1,032 crore, a 33.7% rise over 2009-10. The government holding in ONGC is 74.14%, while it is 84.5% in NTPC. Its holding in IOCL is 78.92% and 80.4% in Engineers India. Bhel and SAIL have government holdings of 67.72% and 85.82%, respectively. The environment for the PSUs improved in 2010-11 as the impact of the fiscal stimulus set in. As a result, the bottom line growth of many of these companies shot up substantially.